'Jheel Ke Us Paar' [review] is a prime-period RD Burman score that, while certainly worthwhile, doesn't quite match up to his finest works. There are likeable songs on it but I'm not convinced any of them will stick with me for very long. If pressed for favourites I might choose Lata Mangeshkar's 'Chal Chalen Ai Dil', 'Kah Rahe Hain' and 'Do Ghoont'; all really good (I like Asha Bhosle's 'Hae Bichhuwa' too) so it does feel kind of strange that I'm not raving about this soundtrack more than I am. 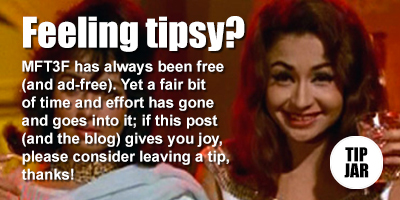 But then there's the knowledge that Burman made 'Anamika' and 'Yaadon Ki Baaraat' at around the same time, and well, those are some benchmarks. But hey, you know what? Comparisons are daft so I'm just going to go ahead and enjoy it anyway. Feel free to join me. I suspect the 7" versions have shortened tracks though? But yeah, it seems it was all the rage at the time, so many of my 1973 soundtracks have electronic stereo. Excellent share PC. I think the songs in this OST are very much situation specific and hence this deviation from the contemporary Pancham da (R.D.Burman) releases. This is just a thought to your description. Film producers were the controller, precisely the last word, to the usage of songs and the duration in the movie. Mono SPs and the EP sound superb but the songs were little butchered. I even jum to the movie sound tracks from You Tube or DVD for the mono versions. At the end of the day I'd rather have a full-length electronic stereo version (I can always press the mono button on my amplifier) than a shortened original mono I think. Yes PC. Using mono button through amp are a little solace to the ERS versions. Parallel binding at cartridge level or using Y cable also works. Sorry for deviating the topic. My recent Sansui AU 717 or Luxman LV series do not contain mono buttons while Sansui AU D7 contain mono button. Shall share a few SP versions mono. I've already posted elsewhere on this wonderful blog, which I literally stumbled upon by chance via Google. However, I feel compelled to offer my two pounds (or rupees..you choose), on something that people here have discussed regards ERS. That's right, ye olde ELECTRONICALLY REPRODUCED FOR STEREO, which was applied at the mastering stage in a blanket fashion from.about 1970 to.1976 to a myriad of releases. The simple explanation, is one of (yet again) economics. 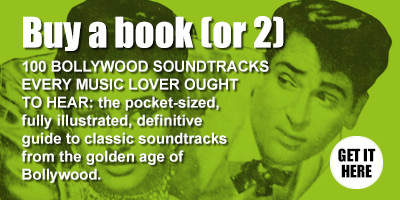 Apart from V Shantaraam's JAL BIN MACHHLI NRIT BIN BIJLI, whose actual soundtrack was recorded in stereo at rajkamal studios (oddly the film's sound is in mono), I think the cost /benefit ratio meant it wasn't worth the extra time and expense to record , mix and master in stereo for EVERY release back then. Not surprising when you consider you've got 20 piece plus orchestras, vocals, electronic instruments and quite limited 4 or 8 track desks . The odd song, yes, but every song on an album...would need a whole host of trained engineers and producers, which wernt as readily available as in the West. Having spent time in enough studios myself as a musician AND in an engineering and production capacity, it's A LOT OF WORK to get a good sonic balance in stereo for orchestrations. As a result, mono and then ERS ruled until the late 70s (DES PARDES & HUM KISI SE KAM NAHIN look like the crossover as SHOLAY'S soundtrack was done in the UK) . ERS was a cheap way of satisfying those who had upgraded their HiFi systems to stereograms (I remember those..my parents had one) and beyond, whilst maintaining speed of recorded output. However, SUPER 7 releases are sometimes horrendous butcherings of the final songs, due to the time restrictions of 7" vinyl, even at lower speeds. I had suspected that the reasons for the mono/stereo issues were economical; thanks for clarifying and supplying more detail. To be honest, I've never really been that much of a hi-fi addict myself; I grew up listening to music on cheap record players and transistor radios, listened to 2nd and 3rd generation tapes passed around by music fans... whether mono, stereo or reproduced stereo was how the music was originally/once released (and presumably enjoyed), I'm fine with that. Butchering in terms of editing and shortening, I have much less time for.